10 super cool ways to flaunt your lehenga before walking down the aisle! 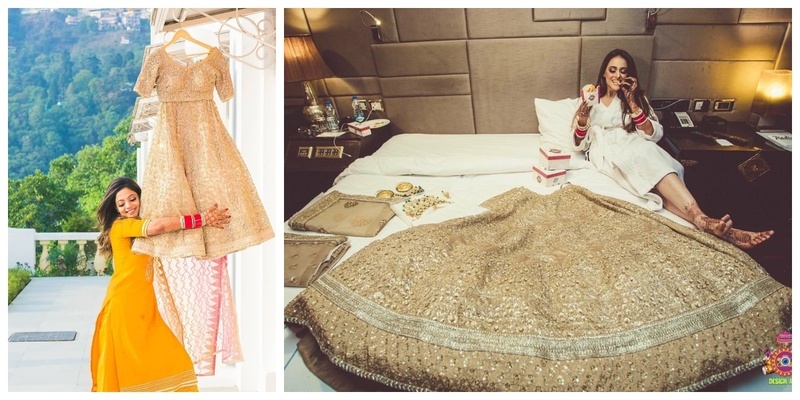 Selecting your bridal lehenga is a tiring process for sure! Hopping around from shops to shops aiming for that perfect lehenga really takes all the energy out of you! Now, of course, your wedding lehenga will create a buzz when you walk down the aisle and all the efforts you put into buying it will pay off! But why to limit the flaunting of your bridal lehenga just to the ceremony? Put it on a quirky hanger or wear the choli with shorts for a little ‘me time’ shoot while getting your makeup and hair done! We spotted some real brides who took some time out and clicked cute pictures with just their lehenga. After all, the coveted bridal trousseau needs a picture that you can look in awe, years after your wedding! 1.The bridal lehenga shot with the coolest caption on its hanger! 2. The bridal lehenga shot in bathrobe #totalchillvibes! 3. The ‘that’s my lehenga’ shot! 4. The eternal love for the big day lehenga! 5. Elegant bride with her subtle red lehenga! 5. The bride who ‘can’t stop admiring her lehenga’ shot! 7. The chill bathtub and bridal lehenga shot! So, which one was your personal favourite?